Collins Compost is a premium quality soil amendment made from a blend of fully composted leaves and cow manure. Rich in organic matter, slow-release nutrients, and beneficial microbes, our compost is the perfect soil builder for a variety of applications including residential gardens and lawns, sports fields, commercial landscapes, and many types of field crops. To obtain the highest quality product for our farm and our customers, our compost is approved for use in organic production. Learn more. 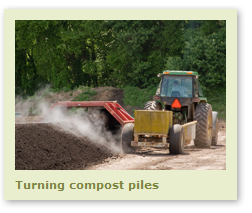 See our page on Ways to Use Collins Compost for recommended applications of our product. The process begins every autumn with the arrival of thousands of cubic yards of leaves. Cow manure from the farm is added to the large leaf piles, which are then turned regularly to facilitate the breakdown of the raw ingredients into compost. After the compost piles are aged to remove any remaining manure odor, the compost is then lab-tested for pH, organic matter, and nutrient levels. The process is complete after the compost is screened to approximately ½" and either bagged or made available for bulk distribution.